The Ardh Kumbh Mela or Half Kumbh Mela event will take place in the first quarter of the year 2019 on the banks of River Ganges at Prayag, Allahabad. You must have come across these terms 'holy river' or 'holy water' many times if you are in India or living with Indian Community in your circles. The river Ganges or 'Ganga' is considered as a very pious and holy river with magical attributes since history immemorial. The Vedas and Puranas glorified "Ganga" as the Holy Mother purifying human beings from their sins. It is believed that the river was formed from heavenly nectar that descended to earth with the help of Shiva on the severe penance of Bhagiratha who brought it down to give rebirth to his ancestors. So, the starting point of Ganges is known as Bhagiratha tirtha on the Himalayas. 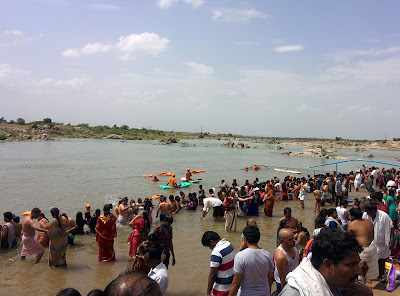 Since it was brought down to earth for giving rebirth or salvation to the ancestors and as it contains heavenly nectar which makes life eternal with no death, people believe that whoever takes bath in this river gets rid of all sins and attains moksha which is free of death and earthly attachments. Holy water refers to the water of Ganges and that of other rivers during some auspicious moments or periods. The waters of other rivers are treated as 'holy water' during the time periods of the occasions of Kumbh Mela or Pushkar that occur at each 12-year gaps. Normal water is also converted into holy water by sprinkling a drop or two of the holy water into it that can be used for religious and other auspicious purposes. That is why some people carry holy water in bottles to their homes after bathing at Kumbh Mela or Pushkar occasions. That water is stored and used for a lengthy period on such auspicious occasions. Kumbh Mela is celebrated after completion of every 3 years at each one of these four places rotationally:- Haridwar, Prayag, Nasik, and Ujjain. The rivers of these four places are respectively as follows. The confluence of 3 rivers - Ganga, Yamuna and Saraswati at Prayag in Allahabad. So, each of these four places celebrates the Kumbh Mela after every 12 years gap. Allahabad- During Magha masa or for approximately 45 days during the months of January-February. Haridwar- During Chaitra masa or for approx. 45 days during March-April. Ujjain- During Vaishakha masa or approximately 45 days during April-May. Nashik- During bhadrapada masa or approx. 45 days during August-September. As per Hindu mythology, "Pushkar" is the name of one great pious person or angel who can live in water and purify the waters. So, Jupiter requests him to travel along with him all through the years and keep purifying all waters of all rivers. Pushkar accepts Jupiter's request and started to live in the rivers along the path of Jupiter. One day's travel of Jupiter is equal to one year for us human beings. 'Pushkaram' is the event of celebration when Jupiter enters into one of the zodiac signs and remains there for one year. The first twelve days are most important and known as adi Pushkaram and the last twelve days are known as Antya Pushkaralu. As per Hindu astrology, there are twelve rashis in each year which are known as zodiac signs. Each zodiac sign is associated with a river. So, when Jupiter enters a particular zodiac sign each year, the river associated with that sign becomes the place of pushkaram for that year. In this way, each river celebrates pushkaram on their turn every 12 years. So, the cities and towns on the banks of each of these 12 rivers celebrate pushkaram or holy dips (also known as pushkaralu in Andhra Pradesh) every 12 years. So, for Kumbh Mela purpose, the above mentioned four places of Allahabad(Prayag), Haridwar, Nashik, and Ujjain are famous where tens of millions of people gather to take bath in the holy river. Regarding pushkaralu, all the places falling on the banks of above mentioned 12 rivers are believed to be auspicious and holy. 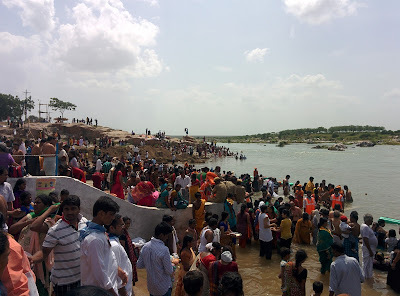 So, devotees flock to any place whichever is nearer to them to take a dip in the holy waters on that occasions. But, much importance is given to those places only with major waters flowing in abundance. It might also be due to the location of famous temples in those places. People pray to God while taking bath chanting God's name or some hymns and take three dips into the waters. Then, they go to the temple on the banks and offer prayers and take blessings of God. For some more details about Kumbh Mela or Maha Kumbh, you may visit this post.